Brentford Market Place was one of the main areas scheduled to be redeveloped as part of a wider scheme to entice people back into the town centre. ‘Making the connection’ is a project set up to improve Brentford town, funded by the Mayor’s outer London fund, London Borough of Hounslow and local stakeholders. The aim of the scheme is to attract people to Brentford High Street, one of West London’s most historic and diverse shopping areas, by improving the public realm space and creating a new route for walkers and cyclists along the Grand Union Canal, between Great West road and Brentford High Street. For over 100 years Brentford Market Place was home to a market where high-quality, locally-sourced produce was sold. The marketwas moved which prompted protests from the local community and as a result it was brought back to the area in 2013. London Borough of Hounslow sought to bring the public realm space to life by improving the hard landscaping, carrying out lighting improvements, introducing art and hosting cultural events to improve this vital community space in historic Brentford. There were two main challenges - the recycling of materials and the timeframe in which the project had to be completed. 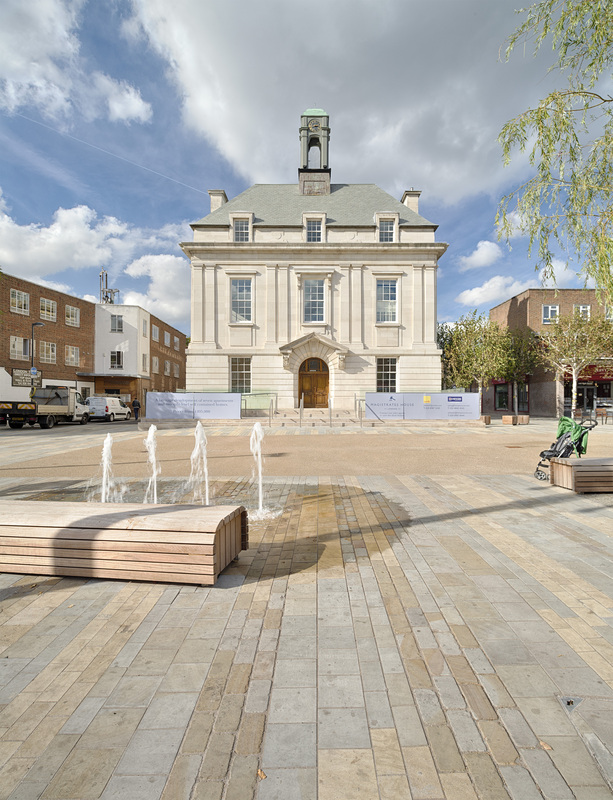 London Borough of Hounslow required paving materials which reflected the history of Brentford, including using as much of the existing Yorkstone as possible. However, the existing materials were weathered and differed slightly in colour to the new materials. There was a 12 week lead-in period for the Yorkstone supply with 16 weeks until the grand opening of the Market Place scheduled in September 2014. In light of this, London Borough of Hounslow issued a letter of intent to allow early procurement of the stone to meet the required deadline which was accommodated by Marshalls. Marshalls’ Scoutmoor and Moselden Yorkstones, renowned for their durability and aesthetics, were selected in different colours and finishes by architects Kinnear. Their vision was to create interesting linear design effects by blending the original and new materials to achieve the desired mix and colour variation. This was the first scheme of its kind to mix Yorkstones in this way. Different surface finishes can enhance the colour differences and add to the overall aesthetic appeal. The tumbled-finished stone provides an antiqued, distressed look, reminiscent of old Yorkstone cobbles and perfectly complements the look of the existing stone. The diamond sawn finish brings the scheme up-to-date, with sleek contemporary lines. Both finishes have excellent slip-resistant properties. It was initially estimated that only a small amount of the existing Yorkstone could be reused, but on inspection of the up-lifted stone it was revealed that approximately 70% could be suitable for reuse in the scheme, highlighting the inherent durability of this material. Marshalls provided sample areas on site to allow the client to give final approval on the colour mix percentages and design layout and delivered the scheme on time. Marshalls’ Dave Stanger, National Commercial Manager for Natural Stone said: “Kinnear produced an exceptional design which has never been seen before in natural stone paving. The bold decision to mix materials has worked beautifully, while also sympathetically reflecting the historic signs of Brentford and creating a distinctive space where local residents and shoppers can feel a sense of pride. Scoutmoor and Moselden Yorkstones are available as paving, setts, kerbs, steps, water management solutions, geometric bespoke designs and seating to complete your project. This is the first scheme of its kind to mix Yorkstones and extends the character of the area into the High Street, creating a thriving social space and offering a new ‘active heart for the High Street’. Tunji Oladejo, Town Centre Project Manager at London Borough of Hounslow described Brentford as a ‘forgotten High Street’ and said the regeneration of the market place has created a vibrant, open space, not normally seen in cities, where children can play and communities can come together. He also stated that the project had been extremely worthwhile and ran smoothly due to the strong relationship Marshalls had with the contractor. The redevelopment of the Market Place has received positive feedback and is now a more suitable space for artisans selling high quality, affordable goods as well as hosting a range of outdoor events.